Our dear friend the pumpkin is out and about in two ways during Fall. You can find him whole and squat in the pumpkin patch, surrounded by the obligatory farm fare, hayrides and apple trees prior to meeting his jack-o-latern fate. Or whipped neatly into a can of puree, where a spatula will cleanly scoop out his fleshy goodness in prep for the bread, muffin or pie of his namesake. But do not fear the portly pumpkin! You can buy these tots at any grocery store—aim for one the size of a large acorn squash. Even I was surprised at the soft flesh once I cut inside; spongy and soft rather than hardened and dense. This pumpkin stew recipe is all about spice. Embodying more of a Latin American flavor, it utilizes fresh cilantro, spicy serrano pepper and of course, smoked paprika. Savory or sweet flavors notice you will not; rather it's that spicy note beneath every bite that rounds out each simmering, flavorful pot. Even before I prepared the pumpkin, I could tell this dish was going to be a hit: the fragrant flavors of stewed tomatoes, onion, garlic, broth and cilantro were just that aromatic. 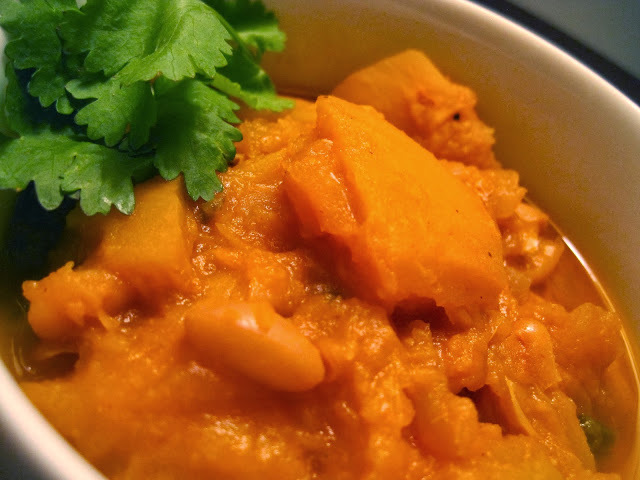 The sugar pumpkin and beans transform the chili-like cognizance of the base into an emboldened fall stew with a lovely texture, and a generous squeeze of fresh lime rounds at the dish at its finale.